Phew, its been a while since I've drawn a blind contour....can you tell? Edgar's son, Louie, is down from Pennsylvania for the summer. So far we've been having a great time swimming, visiting Club Penguin and reading Goosebumps. 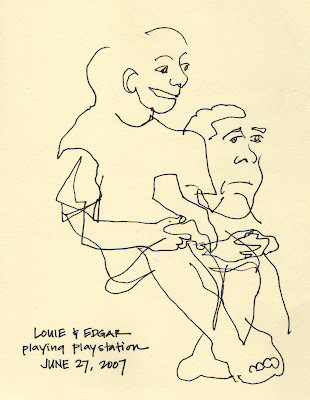 Louie also got a new sketchbook this week so we can pick up where we left off last summer. Yay! One other note to report: Finally, after a little over two months, I finished my horribly nice Venetian sketchbook and can get back to doing what I do best, scribbling in a cheap book with bad paper from Borders! Whoohoo! Edgar looks a little George Bushy here. Perhaps it's the eyebrows. Enjoy your summer! Wow Laura, he does! I hadn't noticed it before...scary!